Have an E46 M3? Click here to view our most recent 2019 article on the M3. We cover proper maintenance, restoration, and modification for both street and track use. Now considered something of a classic, the BMW E46 3-series certainly set the benchmark for sport sedans for years to come – the gold standard for the Ultimate Driving Machine. However like every good game that’s come out, there’s always a few bugs that need patching for things to be their best. The same is true of the E46 – a few choice mods can make an enormous difference in the look and performance of your 1999-2006 BMW 323i, 325i, 328i or 330i [E46]. Why drive around looking like that lady that works in the HR Department with a stock E46? There’s a huge range of parts available to you to make your E46 your own – so why drive around stock for another day? Our Co-Founder, Mike, started ModBargains with Ron over a decade ago when Mike got started modding his personal BMW E46 323i. That’s why in this article we’ll be discussing the Best Mods for BMW E46 325i, 328i & 330i, in terms both veteran enthusiasts and newcomers can understand. Your wheels make a huge part of your car’s visual real estate, and as such, it’s one of the first things people notice. The stock wheels for BMW E46 ranged from decent to disgusting in terms of stock wheel style, but to be frank, nobody ever looked cool on stock wheels. The right set of wheels can really set the tone for a build or act as the finishing touch to tie everything together. One of the best looking wheels out there for the E46 right now comes from Forgestar wheels. Available in a huge variety of colors in sizes from 17in-22in (not that you can go that big), Forgestar wheels are custom-made to each customer’s car – meaning they take time to manufacture to YOUR specs, but they’re worth the wait. They take into account things like whether or not you’re lowered, if you have a big brake kit, if you have a widebody – like the E46 above – and can be powdercoated in amazing variety of colors and finishes. At ModBargains we also keep the most popular fitments for BMW in F14s in stock on hand, if you’re the type that loves instant gratification. And of course, we also offer tires – we stock Michelin Pilot Super Sport, Hankook Ventus V12 Evo2, Continental, Toyo Proxes, Nitto Invo and nearly any other brand – and you can save a nice chunk of money when you get wheels and tires, as you can often get a deal on mounting and balancing or other great incentives. Your wheels are only as good as your tires when it comes to performance, so don’t forget to budget for quality performance tires that’ll stick when shopping for wheels. The stylish split 7-spoke concave design both engenders the classic BMW look yet also has a “custom” touch. The widebody 330ci here is sporting a set of 19×9 / 19x11s in Gloss Black – one of three shades of black – the F14s really “finish off” the car. Forgestar is by no means your only option, there are quite a few great wheel options out there for the E46, so don’t feel like you’re boxed in to one brand. If you’re unsure, you can always ask our friendly and knowledgeable Mod Experts to fill you in on what works for your specific E46 model – the right wheel for you may vary depending on your color, what accessories/mods you have, whether you’re a coupe, sedan, cabrio or touring, there’s going to be a ton of variation. So be creative and express yourself! VMR Wheels has long been in the E46 Wheel game – their VMR V701 Wheels for BMW look especially sharp on the E46 Coupe, and VMR has been a popular choice for the E46 since when these cars were new. Reasonably priced and high quality, the V701 is available in hyper silver and the multispoke design creates a very different aesthetic. If you’re looking for something more in the vein of the classic CSL wheel look, check out VMR V710 Wheels for BMW, seen here in Gunmetal. These wheels give you that traditional “German Car” aesthetic at a price that won’t break the bank – and are available in three finishes. If you have a black E46, the bright Hyper Silver finish available on the V710 offers a great contrast to the dark paint, giving your E46 the visual pop it needs to turn heads whenever you roll up, and the bright silver finish with black also creates a very classy sort of vibe. And of course, if Matte Black is more your speed, the matte black version of the VMR V710 can tie together your other black accents and trim. These are just a few of the options available from VMR, and feel free to consult our Mod Experts for their suggestions. Avant Garde Wheels also offers some great styles for BMW as well, offering a wide variety of styles and options to suit whatever your particular style is. The M220 is a great wheel for those who like the Mesh look or are into the stance scene, the M220 is a versatile wheel that suits several different style builds. Maybe 5-spoke is more your style – check out the Avant Garde M550 in that case; with its bold straight 5-spoke design, it adds a lot of character to the bodylines of your E46. These are just two of the styles available from Avant Garde, and they’re available in an amazing array of colors – enabling them to both be affordable or bespoke, depending on how creative you want to be. If being a hoon is more your style, check out fifteen52 – renowned for their unique look, fifteen52 offers wheels in the 5x120mm fitments needed for the E46. The E46 above is rolling on a set of 18×8.5 / 18×9.5 fifteen52 Tarmac Wheels for BMW, custom powdercoated red (these were probably Rally White originally). With its fat 5-spoke design, the tarmac evokes the look of supercars past with a look that works well on nearly any car. In spring 2016, the 17×8.5 / 17×9.5 fifteen52 Formula TR Cast Wheels on this E46 Coupe above will also become available. First seen at SoCal Euro 2015, the formula TR has some of that classic mesh style to it, as well as the stepped lip, but does it in a way we haven’t seen in other wheels for a look all its own. Ask a Mod Expert to order your set. fifteen52 isn’t the only name from the show scene to offer a great set of wheels for the E46. Another great option is from KLUTCH wheels. Featuring a straight, fat 5-spoke design and a stepped lip, Klutch SL5 Silver Wheels for BMW give your E46 that classic “Euro-Tuner” look. Whatever your style, there’s a huge variety out there to suit your style and your budget. Given how great the E46 looks on an aftermarket set of wheels, why on earth would you leave your stock wheels on to ruin your BMW’s great looks? From the Klutch SL5s to Forgestar F14s, it’s easy to see how well the right set of wheels compliments the E46’s classic lines. Not sure what fitment is best for your particular E46? Have a touring? Xdrive? Something else funky? Consult our Mod Experts for their fitment recommendations – give the team a call at 714-582-3330, chat live at ModBargains.com or just stop by the ModAuto shop in La Habra, CA and see us in person. After getting the right set of wheels, the next thing you’re going to need for your E46 to look and perform its best is a drop. A nice set of wheels on a stock ride height E46 is a bit like putting ballet shoes on Mike Tyson – something doesn’t look right. The excessive wheelgap burns into your eyes like the gap between Tyson’s teeth. Eliminating the unsightly wheelgap is easy – lower your BMW E46’s suspension. There are several ways to “get low”, but before we get into the suspension mods for your E46, we need to talk about something important that’s specific to the E46’s suspension. The newest E46 is now 10 years old, meaning that there are a few maintenance concerns to think about beyond just “lowering it” and calling it a day. As we said in our article on BMW E46 Strut Tower Mushrooming and How To Stop It From Happening, The OEM strut towers of your BMW E46 3-Series are a weak point of the car’s suspension and chassis, and so the forces acting on your shock absorbers or coilovers are also acting on the strut towers, flexing them slightly and slowly but surely stretching them out. Ironic that despite its great handling, the wear and tear on the BMW E46 Suspension itself is the problem. BMW Engineers have long been in a struggle to shave weight wherever possible as they’ve added more and more features to the 3-Series – starting back with the E36, with new technologies like CAD design and accurate fatigue modelling at their disposal, BMW created a lightweight chassis that could withstand the load of the STOCK suspension without deflection or deforming, allowing BMW to make the materials of the shock tower area itself as thin as is possible while still retaining the strength to withstand the load of the car’s projected lifespan. What this means is that because of the thin materials, if you increase the loads on the towers (ie by installing stiffer, lower springs or coilovers that transmit more load than the OEM shocks), the shock towers can’t stand up to the forces it is being subjected to. With the car sitting lower, the potential for bottoming out the suspension is much greater as well – so when the car bottoms out on something like a pot-hole, the force thrusting upwards causes the strut tower to “mushroom” open, bending the strut mount studs outwards. Fortunately, the solution to the problem is both simple and inexpensive. Simply fitting a set of these OEM BMW E46 shock tower reinforcement plates corrects this issue and gives the strut towers the strength they need to withstand the stresses sent through the chassis and prevents the issue. Of course, if your shock towers are already mushroomed, unfortunately it’s too late for reinforcement plates and more aggressive means will be necessary to correct the mushrooming. At just $18.99+shipping for a pair, these are so cheap, as a piece of OEM BMW PREVENTIVE MAINTENANCE, there’s really no excuse not to have them – and infinitely cheaper than fixing your strut towers once they’ve already mushroomed. Sold in pairs of two – it’s important to remember ALL FOUR of your strut towers suffer from this same structural flaw – these are something you should STRONGLY consider before converting to coilovers. Something else worth mentioning is that a good strut tower brace does the same job as the Strut Tower Reinforcement Plates, with the added benefit of increased chassis rigidity, making it an even better excuse to get that sick Dinan Carbon-Fiber Trimmed strut tower brace you wanted. Note how the strut tower brace mounting points support the entirety of the strut towers – and that’s why you can do a FSTB in lieu of the reinforcement plates. 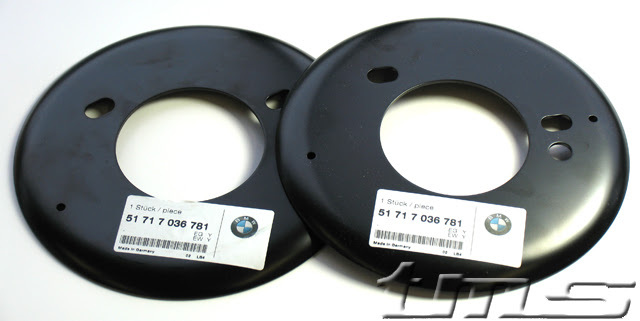 Interested in ordering a set of OEM BMW Front Strut Tower Reinforcement Plates for 1999-2006 BMW E46? Click here to get yours. With that out of the way, let’s get into the nuts and bolts of how to lower your E46 to eliminate the nasty wheelgap. There are two major schools of thought- lowering springs, or coilovers. Lowering Springs are cheaper and simpler up front, but don’t take into account that your shock absorbers will eventually need to be replaced as well, whereas coilovers replace both spring and shock for a more complete upgrade, and offer ride height adjustment and other perks. Eibach Pro-Kit Springs for BMW E46 3-Series will lower your 3-series 1.2-1.4in up front and 1.0-1.4in at the rear, depending on your model. Eibach is a great choice for a daily driven vehicle, offering a good compromise of ride quality to handling performance. The lower ride height really makes the car look worlds sharper, and the lower center of gravity and performance spring rates will make your 3 carve corners sharper than ever. If preserving ride quality is one of your biggest concerns when thinking about lowering your E46, consider Vogtland Springs for BMW E46 3-Series. Specifically designed with preserving ride quality while also enhancing handling performance and giving the car a nice visual drop, these are an ideal choice to keep your E46 riding comfortably even after you lower it. With a drop of 1.4in front and rear on 6-cylinder models, the visual effect is great too. As we mentioned earlier, if your E46 suspension has more than 50k on it, the shocks/struts are due for replacement – Vogtland offers a spring/shock combo package in their Vogtland Sport Suspension Kit for E46 to get more bang for your buck. For those who prefer a firmer ride and sharper, more responsive handling at the expense of some ride quality, H&R Sport Springs for BMW E46 drop the car 1.2-1.4in up front and 1.0-1.2in at the rear and offer more aggressive spring rates than the other two. As we said, with any lowering spring, you’re eventually going to have to replace the shock absorbers, and it’s literally the same amount of work to install a set of springs as it does to install a set of coilovers, and when you factor in the cost of shocks, coilovers become a bit more economical than you’d think. If you want to have precise control over exactly how low your E46 is, or get REALLY low, then a set of Coilovers is what you want. Coilovers integrate the spring and shock absorber into a single unit, and moves the spring onto a threaded perch, allowing you to adjust the ride height of the car up and down. Some coilovers offer additional adjustments like shock damping, bound/rebound, camber caster and more. On the E46, most Coilovers are going to be an integrated spring and shock up front, with an adjustable spring and shock for the rear. Coilovers aren’t just “for trackday guys”, they’re great for street use, too. A set of Vogtland Coilovers for BMW E46 is surprisingly affordable, and their fixed damping means there’s no adjustments to mess with or “set up”, and like their springs, their coilovers are set up to ride as comfortably as possible. On the other hand, if you DO want the adjustments, a set of BC Racing Coilovers for BMW E46 3-Series are a hell of a value, offering 30-way adjustment for just 10 benjamins. BC Racing Coilovers for E46 have been incredibly popular at the shop here, and considering the quality of the coilovers and functionality offered for the price, they’re a hard value to beat, and the performance is great too. It’s worth mentioning that these are a sport oriented coilover and as such, they’re not going to be as comfortable as the Vogtlands we mentioned earlier. If you don’t live in a snow-belt state, ST Suspensions Coilovers for BMW E46 3-Series are another great option. Like the Vogtlands, these coilovers are fixed damping but offer a sportier ride. As you can see here, coilovers allow you to dial in your ride height for the perfect stance like the sedan you see here. Your E46 CAN look this good, it’s just a matter of dropping it. Let’s say money’s tight – like college student status, or “Grassroots Racer Budget” kinda funding. You can still pick up a set of quality coilovers that will perform well. A couple of the engineers at KW got fed up with the bureaucracy and the marketing nonsense that comes with having a huge international corporation, and set out to make their own coilovers for enthusiasts that performed well as inexpensively as possible. Solo-Werks Coilovers for BMW E46 are the end result of their efforts. Solo-Werks S1 Coilovers for BMW E46 are a no-frills, simple quality coilover for your E46, at the incredibly low bargain basement price of $549 (as of press time)- you can hardly replace your OEM shocks for that price! And the thing is, the parts are solid, not like the junk you’d get off ebay for the same price, and while the coilovers are fixed damping, the Solo-Werks guys personally develop the valving they want for each platform they release coilovers for – meaning these guys put seat time in an E46 on these things to get it dialed in for production. These things offer a huge value for the money, especially if you don’t need the adjustment. However you choose to do it, lowering your E46 will make your 3-Series look worlds better and perform better than ever. If you’re not sure how to go about it, ask our team of Mod Experts – give us a call at 714-582-3330. Our friendly and knowledgeable team can point you in the right direction and get you on the path to get low. Of course, should you need installation, we can do that for you as well at the Mod Auto shop facility in La Habra, CA. The intake system of your E46 is a bit on the restrictive side, and fitting a high performance intake upgrade for BMW E46 will give you more power you’ll hear and feel every time you get on the throttle. When it comes to making your straight six sing, this is one of the first steps. Injen Technology offers two different intakes for 6-cylinder E46s, the full length Injen RD Intake for BMW 323i/325i/328i [E46], and the SP short ram. The intake above is the former. Available in black OR polished (not just the polished version here, Black looks quite sharp), this intake relocates the filter inlet much further out of the engine bay for true cold air induction, and yields a moderate power gain of around 9-10WHP / 8-9WTQ. The other option is the Injen SP Short Ram Intake for BMW 323i/325i/328i [E46], which features a heat shield to seal it off from hot engine bay air but also keeps the intake mounted higher up, which is important if you live somewhere that gets a lot of rain. Also available in polished or black, this intake upgrade is good for a tidy gain of 9.44hp and 8.45tq at the rear wheels. Mishimoto recently unveiled their Mishimoto Intake for BMW E46 3-Series, which offers an aggressive intake note and moderate power gains. Combined with the Mishimoto Intake Hose Kit for BMW E46 3-Series, this upgrade offers a complete intake setup that replaces more of the restrictive factory intake tube. 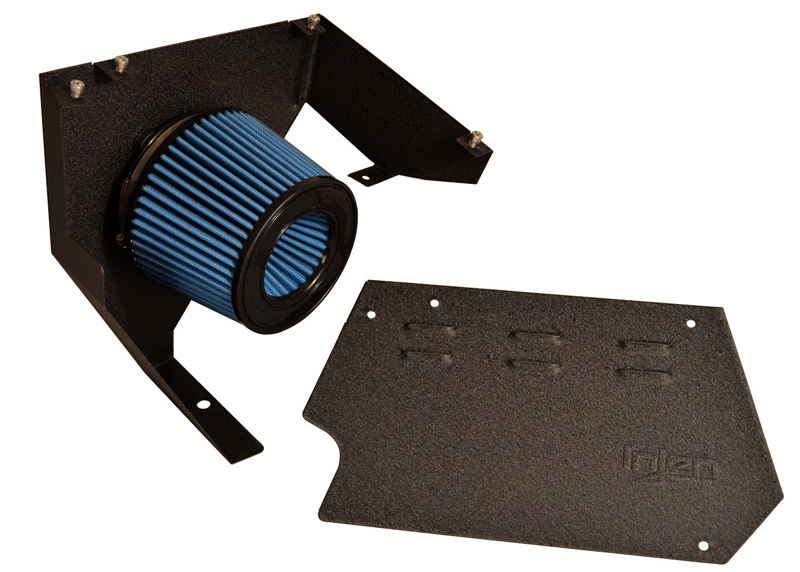 The Mishimoto Intake features an open top, creating an even more aggressive sound. If you want something that’ll really turn heads at shows under the hood, consider the rare and rather badass looking BMW Performance Intake for BMW E46 325i/328i. Featuring carbon fiber trim and an upgraded direct-fit airbox, this is one of the cleanest intake options, fits perfectly like an OEM part and offers a moderate 3-5WHP gain. While it’s not the most potent intake, it certainly is one of the best looking, and that purdy carbon fiber’ll cost you, as this is the most expensive airbox for E46 we offer. Before we move on to the exhaust, one upgrade to consider to make your intake even more effective is an aFe Throttle Body Spacer for BMW 325i [E46]. This throttle body spacer delivers a rather absurd-sounding but dyno-proven 10whp/14wtq gain over stock, and considering it’s rather affordable ($179 at press time), why not give it a go? There’s a huge debate over throttle body spacers which we won’t get into here, but the fact is, changing the intake manifold’s length (after the throttle) will have an effect on the powerband of a car – how much that is varies dramatically, but this is one particularly intriguing example. Upgrading the intake of your E46 will make it sound better and put down more power every time you sink your foot to the floor, so considering an upgrade for your intake should be on your to-do list. If you’ve ever heard an engine in the distance and had to turn your head to look and see what it was, that right there is one of the biggest reasons to upgrade the exhaust system of your BMW E46. The exhaust gives the rear end of your E46 a ton of character and makes up a ton of the rear end real estate. The Remus Sport Exhaust for BMW E46 3-Series is available in dual-side exit (quad tips) or single side exit (dual tips), and a wide variety of tip styles to give you a huge range to choose from to suit the style of your E46. Remus is the OEM manufacturer for BMW’s stock exhaust systems, so their parts fit well and will stand the test of time, but with a more authoritative tone than the factory muffler. Its middle-of-the-road balance of sound to cruising comfort makes the Remus Sport Exhaust for BMW E46 an excellent choice. If you prefer a more aggressive tone, check out the Rogue Engineering IKON Exhaust for BMW E46 3-Series. Offering a great blend of deep tone and minimal drone, this system is another great choice for a daily driven car, as Tim P can tell you in the review below. I wanted a little more grunt compared to my stock exhaust. This exhaust has a really clean deep tone, it’s definitely not the loudest exhaust but it’s great for a daily driver. I can still have a conversation while cruising around and there’s no droning at all. One of the tips looks like it was bent during shipping but it’s an easy fix. Highly recommended! The other popular option is the Borla Cat-Back Exhaust for BMW E46 325i/330i, which offers a restrained, but smooth exhaust note. These are just a few of the exhaust options available for your E46 – check out our full selection of Exhaust Systems for BMW E46 3-Series here. When shopping for your exhaust, it’s important to keep in mind that the sound of the system is its most important feature, so be sure you listen to sound clips of the systems you’re considering to see what you like best. If you’re not sure, you can always consult our team of Mod Experts -give em a call at 714-582-3330, chat live at ModBargains.com or stop by the showroom. Beyond the power mods, the stock trim of your average 325i isn’t exactly exciting. Make your 3-Series a car you turn back and look at as you walk away after parking and break necks when you roll up to meets or just the valet. There’s many different looks out there for your E46, but here are just a few options. One of the best looking front ends for the BMW E46 is the CSL Front Bumper. The bumper comes complete with carbon fiber splitters, and that single opening on the driver’s side? That’s an intake inlet hole, should you want to go true-ram air, you can hook that bad boy up! A CSL Style Bumper s a great way to set your BMW E46 apart from the crowd, and the combination of the CSL bumper with non M fenders creates a surprisingly clean look. Want the whole CSL shebang? We offer a package complete with the CSL Bumper, CSL Trunk and CSL style wheels all in our convenient Complete CSL Body Kit Package for BMW E46 3-Series, which offers serious savings on both parts and shipping by buying together. If you just have a standard 323i, 325i or 328i, you can give it some personality and a bit of ZHP flair with the Mtech II Front Bumper for BMW E46. But what if you wanted that classic M aggression? Consider a BMW M3 Bumper for BMW E46 – just don’t do the M3 badge on a non-M car, as it’s a bit of a faux pas. On a non M car, the M3 bumper really makes the E46 look “Right”, and works on nearly any color, like this gorgeous shade of green. We have the M3 Bumper for BMW E46 in stock along with many other E46 accessories here at ModBargains. The small details can have a huge impact on the look of your E46 as well. A set of Matte Black Kidney Grilles for BMW E46 really cleans up the front end. Carbon Fiber Kidney Grilles for BMW E46 are also available if you’re doing carbon fiber accents. After the front end is sorted, the rear end is what needs attention. The CSL Style trunk for BMW E46 is what the car should have come with from the factory, to be blunt with you. That’s why all those years ago Co-founder Mike fitted a Carbon Fiber CSL Style Trunk for BMW E46 on his E46 323ci. The CSL Style Trunk adds a functional and gorgeous ducktail right into the contours of your trunklid, making your E46 look as it always should have. Of course, Mike painted his CSL Style Trunk for BMW E46, leaving a strip of carbon exposed, but the trunk looks great in bare carbon as well. And black carbon fiber gives any black car a “stealth” look. The CSL trunk looks great, but it looks better when you combine it with a BMW E46 Mtech II rear bumper. You can’t exactly put an M3 rear bumper on your E46 (without a LOT of work), but the Mtech bumper gives the back end a more sporting character. With or without the CSL decklid, the Mtech II style rear bumper really fits the E46′ character beautifully. From mild to wild, like the Widebody BMW E46 above, your E46 exterior really allows you to express yourself. Not sure what might look best for your combination? Ask our Mod Experts – that’s what we’re here for, or heck, even ask Co-Founder Mike Brown himself about the exterior mods he made on his own personal E46 323ci a few years back for his tips to get the platform looking its best. Give us a call at 714-582-3330, chat live at ModBargains.com or stop by the showroom to check out what exterior mods we have on hand and in stock. We keep a large supply of BMW E46 Exterior mods in stock, so stop by today. Last but not least is the lighting system of your E46. Upgrading the lighting components on the car not only makes the car look more upspec, but also takes years off its appearance. Your BMW may not have been equipped with factory angel eyes or HID projector headlamps, so if you weren’t lucky enough to get projectors with HIDs as stock, a set of DEPO HID Projector Conversion Headlights for BMW E46 3-Series are an ideal upgrade, offering not only much improved visibility for you as the driver, but also they look better at night and in daylight on the car. These headlights also feature bright Angel Eyes that really give the car that “BMW” look. The Smoked LED Turn Signals for BMW E46 complete the projector look. If you’re not equipped with projectors but still want that classic BMW Angel Eye look, a set of CCFL Angel Eyes for BMW E46 can also be retrofitted, which give the car a bright crisp white look. Let’s not neglect the rear end of the car, though. LED Tails are the standard these days and visually update any car. We offer LED Tail Lights for BMW E46 Coupe – as well as LED Tail Lights for BMW E46 Sedan to take the years off your back end and eliminate the incandescent bulbs from your E46. However, if you just want to give the car a cleaner look, a set of Clear/Smoked Red Tail Lights for BMW E46 Sedan are a great “like factory” option for those who prefer the “OEM+” aesthetic. A set of Bright White LED License Plate Lamps for BMW E46 will also dramatically improve the night time look of your 3-series. Upgrading your lighting will have a huge impact on your 3-series, especially during winter when you’re driving home in the dark, and crisper lighting will give your car a more upscale look than that pedestrian stock 325i next to you. When it comes to modding your E46, with as available as parts are these days, the only real limit is your imagination. So that’s it for our recap of the best mods for the BMW E46 3-Series – we hope this information was helpful, and thank you for reading. Interested in spicing up the look and performance of your BMW E46 323ci, 325i or 328i, sedan, coupe, cabrio or touring? Ask the Mod Experts what exterior upgrades are available for your car to change the style of your ride. Call us at 714-582-3330 for expert car mod advice and schedule your installation at the Mod Auto shop today. thanks, i wanted to see what the white turn signal looked liked vs. the yellow. Very helpful! The throttle body spacer is only made for 325… I cant find one specific for the 330, but in comparing the 325 throttle body to the 330 they are visually identical. bolt pattern and size look the same, so I was wondering if anybody knew if it will fit from experience, or why it wouldn’t Work even with some clever modification to enable it to fit. Sorry for the late reply. There are several things that could contribute to your rear tires becoming toed out (after being aligned properly). Worn bushing on the control arm or strut rods, damaged strut towers, or failed wheel bearings (though this is very noticeable by the sound). If you don’t find an issue with any of these you should make sure everything was tightened properly when the alignment was performed. Quite honestly a great little intro piece for people like myself just getting into the BMW world. Thanks for the time and effort that went into this.